The Citronella Experience Have you ever dreamed of a place where you can get lost in time? A tropical paradise with emerald ocean water, manicured lawns, exotic colorful flowers, overhanging stone pathways leading to huge coconut trees, and carved steps leading to the ocean from the cliffs. Citronella was founded in the early 1970's by it's present owner searching for his piece of paradise. He has created a resort where you can truly get away from it all. Citronella caters to people from all over the world. Most of our clientele are repeat customers who return to Citronella for its location, beauty, healthy food, and secure atmosphere. Citronella is beautifully carved into the volcanic cliffs 50Ft. above sea level in Negril, Jamaica. With almost three acres of lush tropical landscape, this property has been kept in the "traditional Jamaican" environment. 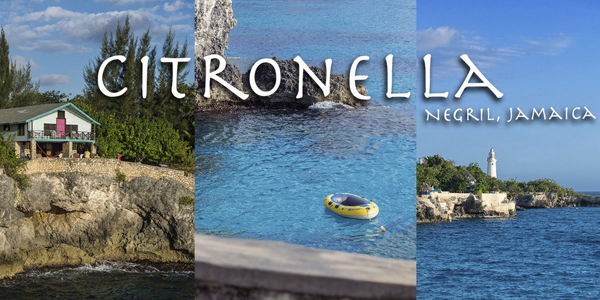 Citronella offers sea breezes, quiet caves, secluded coves, grottoes, and most of all privacy. Citronella also specializes in catering to large groups including: Weddings Family Reunions Corporate Parties ** Restaurant, and floral designer/studio on site!